Inter Milan striker Mauro Icardi has been told his problems cannot be solved by "likes on social media" amid an ongoing contract dispute. Icardi, 26, was last week stripped of the captaincy and refused to travel for Inter's Europa League last-32 first leg with Rapid Vienna. The issue has been fuelled by comments from Icardi's wife and agent, Wanda Nara, on Italian TV and social media. Inter coach Luciano Spalletti said "real contact" was needed. Spalletti said: "Some problems aren't resolved via chat, videos and 'likes' but with words and being together. "For Icardi a recovery plan will be put in place, but less social network and more reality. "In these cases, remembering how it was once done would be a step in the right direction, even if the world is more technological now." 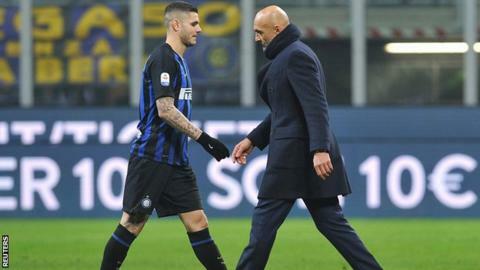 Icardi, who has scored 15 goals in 28 games this season, claimed a knee injury was the reason he missed the game in Vienna last Thursday, which Inter won 1-0. He also watched from the stands as his side beat Sampdoria at the San Siro on Saturday. On Wednesday, Inter said a scan on the knee "did not reveal significant changes compared to those performed before the start of the current season". Icardi, who has eight caps for Argentina, has scored 122 goals in 208 appearances for Inter, who are third in Serie A, 20 points behind leaders Juventus.